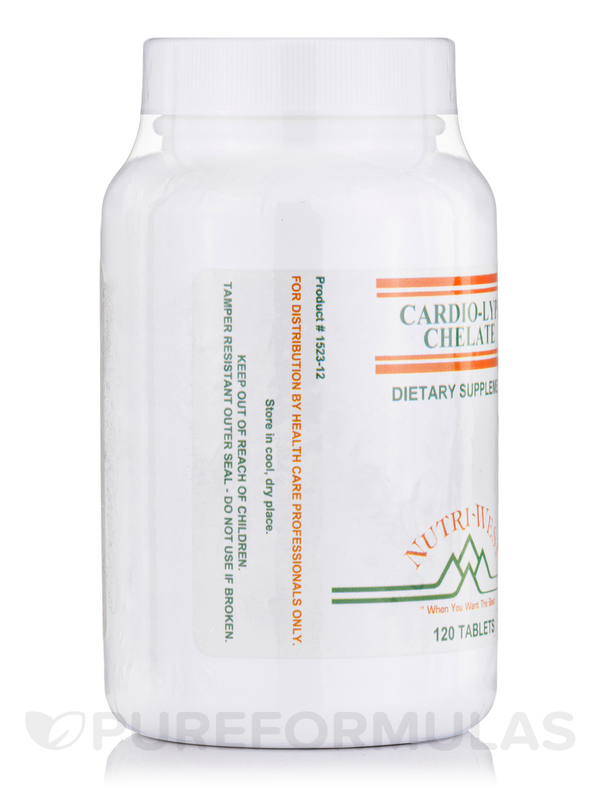 The wide variety of ingredients featured in Nutri West's Cardio-Lyph-Chelate may offer support for your circulatory system‚ the network of organs that are responsible for moving blood and lymph fluid‚ which can transport essential substances throughout the body. This essential vitamin may help support ocular‚ skin‚ and immune health. This substance is a flavonoid‚ a plant pigment that can have potential health benefits. Some studies and research suggests that rutin may help strengthen blood vessels. Additionally‚ flavonoids can exhibit antioxidant features. Antioxidants are substances that scavenge the body for free radicals that may cause cellular damage. Also known as vitamin B9‚ folic acid (like most B vitamins) is essential in maintaining healthy blood by deterring anemia‚ a condition characterized by the low production of hemoglobin (red blood cells). Hemoglobin is responsible for transporting oxygen from the lungs to the rest of the body. Folic acid also plays a role in the development of the genetic material‚ DNA. This Cardio-Lyph-Chelate ingredient may offer several potential health benefits. For instance‚ hawthorn berries may be able to support the widening of blood vessels‚ which controls the amount of blood pumped through them. This essentially means that hawthorn berries may support cardiovascular health‚ which implies that they may also support the normal function of the circulatory system. 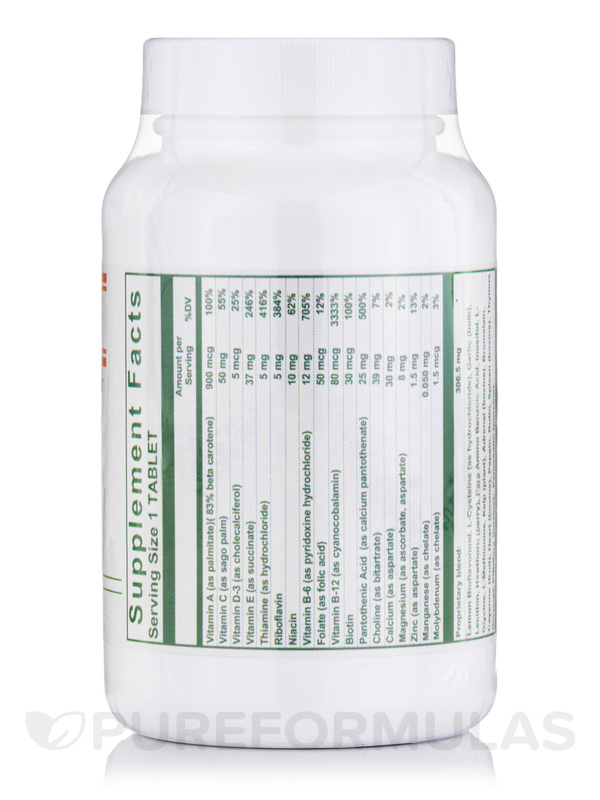 In addition to the possible immune boosting benefits that this essential vitamin is famously known for‚ vitamin C may also help support cardiovascular function. These are only a small taste of the ingredients formulated into Cardio-Lyph-Chelate. For the full list‚ check out the "Ingredients" tab above! Each Tablet Supplies: Vitamin A (palmitate) 500 i.u‚ Beta Carotene 1250 units‚ Vitamin D-3 16 i.u‚ Vitamin C (sago) 50mg‚ Vitamin B-1 5mg‚ Vitamin B-2 5mg‚ Vitamin B-6 12.5mg‚ Vitamin B-12‚ 83mcg‚ Biotin 33mcg‚ Niacin 10mg‚ D Calcium Pantothenate (Pantothenic Acid) 25mg‚ Folic Acid 50mcg‚ Vitamin E (succinate) 60i.u‚ Iodine (kelp) 16mcg‚ P.A.B.A. 16mg‚ Lecithin 20mg‚ Choline Bitartrate 41mg‚ Cysteine HCL 41mg‚ L-Methionine 12.5mg‚ L-Lysine 16mg‚ Bromelaine 5mg‚ Lemon Bioflavonoid 150mg‚ Rutin 5mg‚ Inositol 12.5mg‚ Garlic (bulb) 20mg‚ Cayenne (fruit) 5mg‚ Hawthorn Berries (fruit)16mg‚ Pancreatin 6X 4.2mg‚ Thymus 5mg‚ Spleen 5mg‚ Heart 5mg‚ Adrenal (Nutri-trophic) 5mg‚ Whole Pituitary 5mg‚ Papain 5mg‚ L-Glycine 12.5mg‚ Calcium (as gluconate/ascorbate/aspartate) 5.56mg‚ Manganese (as chelate) 41.6mcg‚ Copper (as gluconate) .104mcg‚ Molybdenum (as chelate) 2mcg‚ Chromium (as chelate) .034mcg‚ Selenium (as chelate) .0005mcg‚ Potassium (as aspartate) 416mcg‚ Magnesium (as ascorbate/aspartate) 5mg‚ Zinc (as aspartate) 1.5mg. 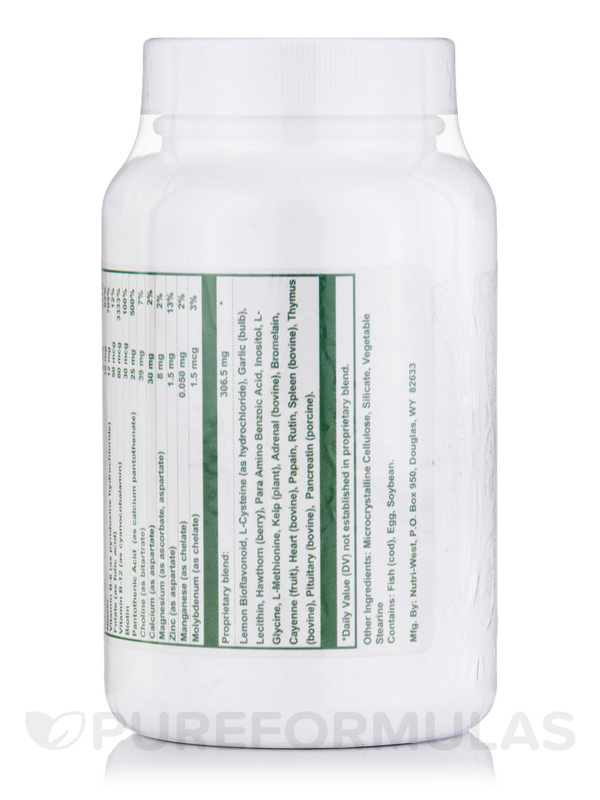 In a base containing: Calcium Phosphate‚ Magnesium Phosphate‚ Calcium Fluoride‚ Ferric Phosphate Kali Phosphate‚ Silicea‚ Chlorinum‚ Peppermint (leaves)‚ Black Cohosh (root)‚ Scullcap (plant)‚ Licorice (root)‚ Watercress (leaf)‚ Eleuthero (root)‚ Red Beet (root)‚ Parsley (leaf). Caution during pregnancy. High dosages of vitamin C (>1000 mg.) should not be taken by gout patients or by kidney stone formers. Vitamin C is contraindicated in iron overload disease. Hyperparathyroidism or sarcoidosis patients should avoid vitamin D supplementation. As a word of caution‚ high amounts of vitamin E (> 400 IU) and garlic are contraindicated with anticoagulant drugs such as coumadin. Hawthorn berries‚ licorice root‚ and Eleuthero are contraindicated in hypertension and/or when taking heart medications. Pituitary glandular is contraindicated in cancer. This formula does not contain large amounts of any of these ingredients. 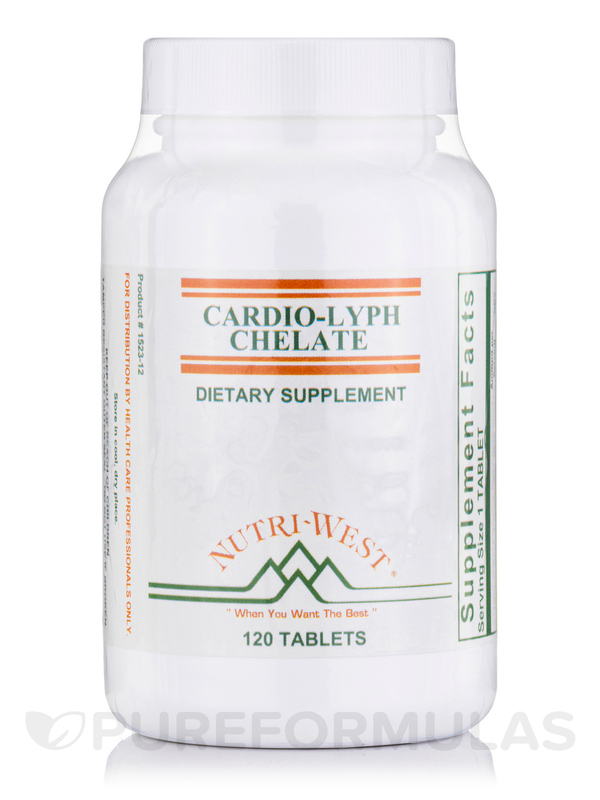 I started using Cardio-Lyph-Chelate by Nutri West in the 80's when it was recommended to me by a chiropractor for removing plaque from the blood vessels. It works for me! Quite a few years ago about 25 now I'd say my then chiropractor had me analyzed by a specialist who had an awesome track record in the that field. Like a lot of men Id beaten myself up over the years more focused on getting things done and less on maintaining good health. Id eat on the run beat my body up showing those working for me how to work hard. I developed a great crew but over time my neglect of self health was starting to show in many ways. Too much coffee junk food and the signs that had haunted my own father in life were starting to show in my own life. Pain in my legs joint pain and other things. This doctor/chiropractor prescribed Cardio-Lyph-Chelate by Nutri West and told me that I needed to be taking it for some time thereafter to clean up my veins. I did so and to my surprise the joint pain left the pain in my legs left and years later as I continued to take these pills one a day I have been able to maintain optimum health to the amazement of others especially younger brothers and sisters in my family. When I go in for check ups at age 70 now and they take your blood pressure the nurses are always amazed that my blood pressure is like that of a teenager. So thats my story and what I feel is the result of my taking this pretty darn good product. It works to keep veins and arteries clean as near as I can tell with having used for as long as I have.